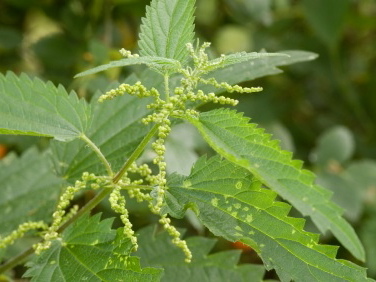 Tiny glass-like needles, each with a bulbous base filled with chemical irritants, cover the leaves of stinging nettles. The lightest touch shatters them and unleashes a poisonous brew of neurotransmitters, histamines, and formic acid, the same acid that makes bee stings and ant bites so painful. The smart thing is to avoid stinging nettles altogether. Unless you want to eat them, that is. A quick blanching neutralizes their sting, and when cooked, nettles have a robust, almost meaty flavor. The leaves are high in calcium and iron, and studies have confirmed their effectiveness as an anti-inflammatory, a use that goes back to ancient Greece. Called subrich (soo-brick) in the Piemontese dialect of northern Italy, these are basically little eggy fritters, frittatine in Italian, served as an appetizer. Almost any tender spring greens can replace the nettles, but the flavor will be different. Later in the year, I use spinach, arugula, beet greens, or even broccoli rabe, and add a couple of tablespoons of chopped fresh herbs. Stinging nettles (Urtica dioica) grow throughout North America, but are especially abundant in the wet coastal forests of the Pacific Northwest. Anyone who’s inadvertently stumbled into a patch remembers what they look like, and it’s easy (if painful) to test a leaf to make sure it stings. Bring along an experienced forager if it’s your first time out nettle-gathering, and don’t eat the leaves if the nettles have flowered or gone to seed. After that point, they develop bits of calcium carbonate which may cause urinary-tract irritation. You might be lucky enough to find foraged nettles at your local farmers' market during the spring and early summer. They often grow in the same places where morels are gathered, so ask your local mushroom pickers, too.